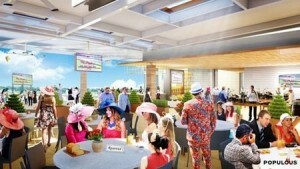 Track owner Churchill Downs Incorporated has announced plans for a $5 million capital investment that will expand the Starting Gate Suites through the construction of a new 20,000-square-foot rooftop garden which will deliver a unique hospitality experience with exclusive sightlines and access for more than 500 ticketed guests. The innovative and picturesque rooftop space, located high atop the Starting Gate Suites on the north end of the 190-acre facility at Churchill Downs, will provide covered reserved seating for more than 250 guests and approximately 250 additional Standing Room Only access tickets. More information on the individual tickets to the new space for the 2019 Kentucky Derby Day will be made available during the online ticket sale later this year.